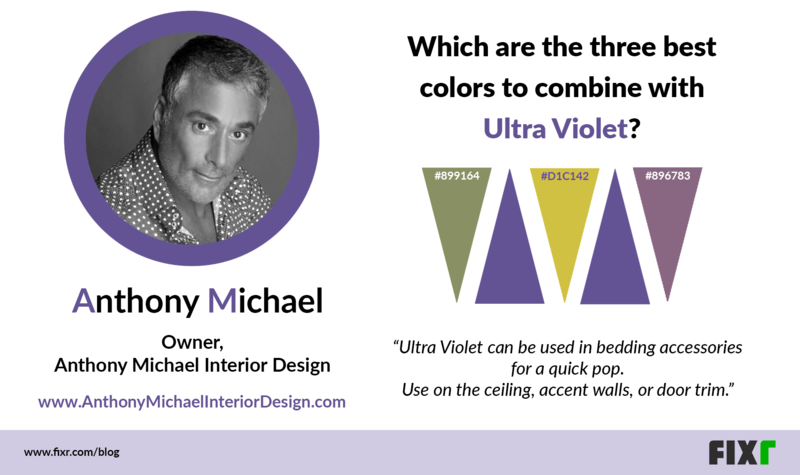 The practice of interior design has evolved greatly over time. 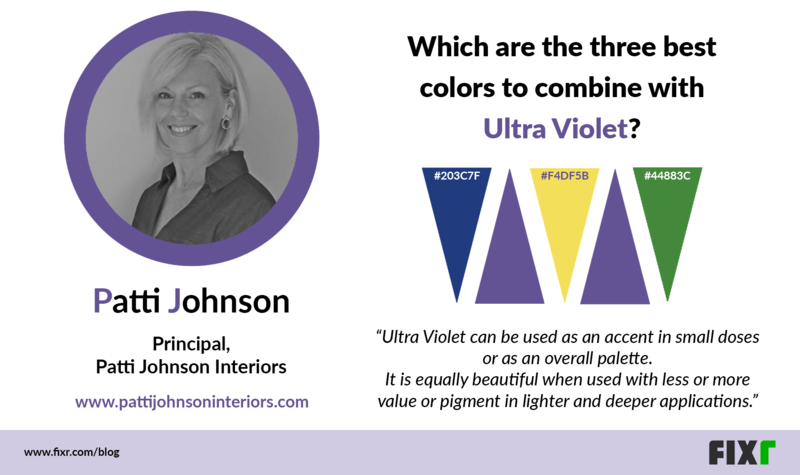 The modern professional interior design industry was born in the 1950s, and it was around this same time that Pantone was born and introduced the Pantone Matching System (PMS) to the graphic arts community. 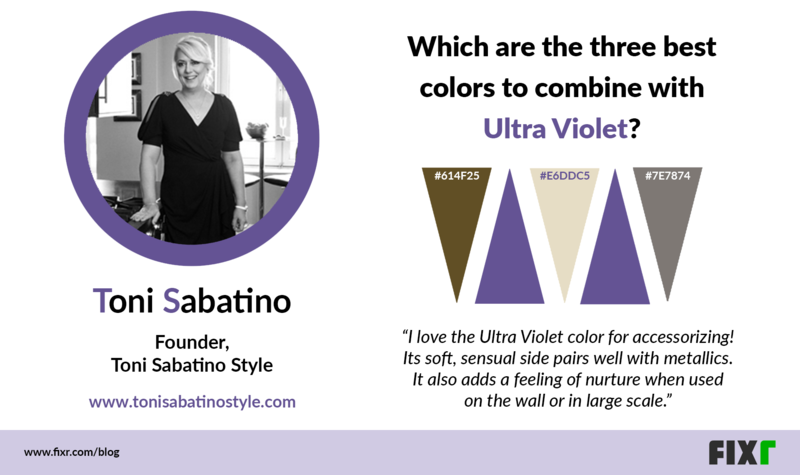 Just as the interior design industry did, Pantone has evolved. 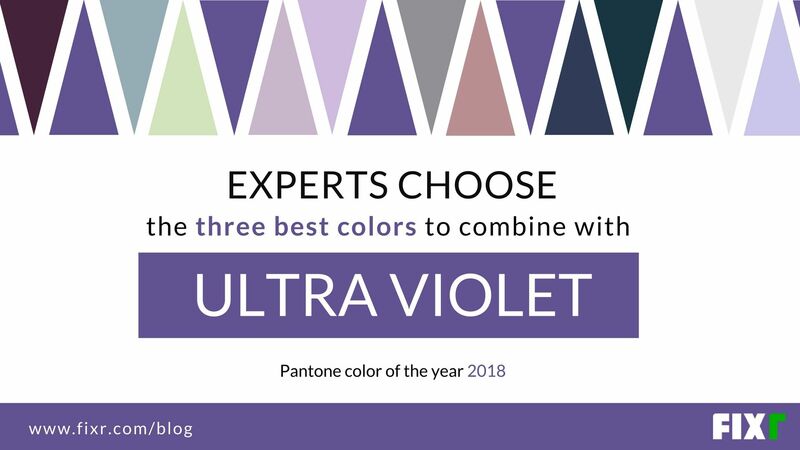 Since 2000 they have been selecting and announcing their “Color of the Year”. 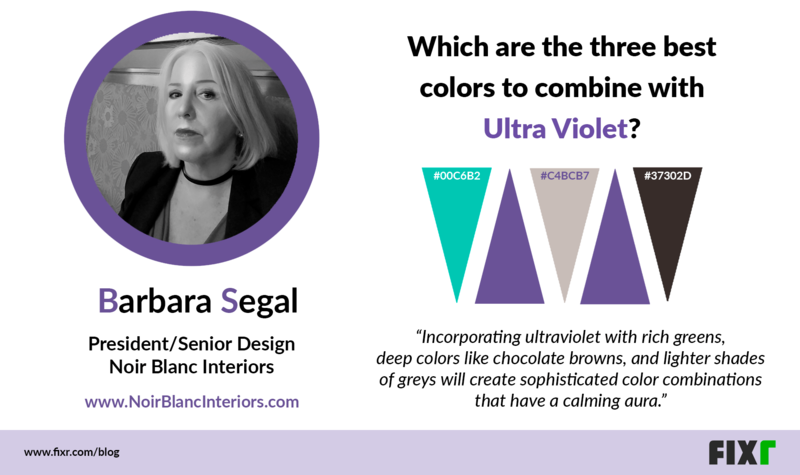 The announcement is highly anticipated each year as it is known to both predict and influence trends in multiple industries, interior design among them. 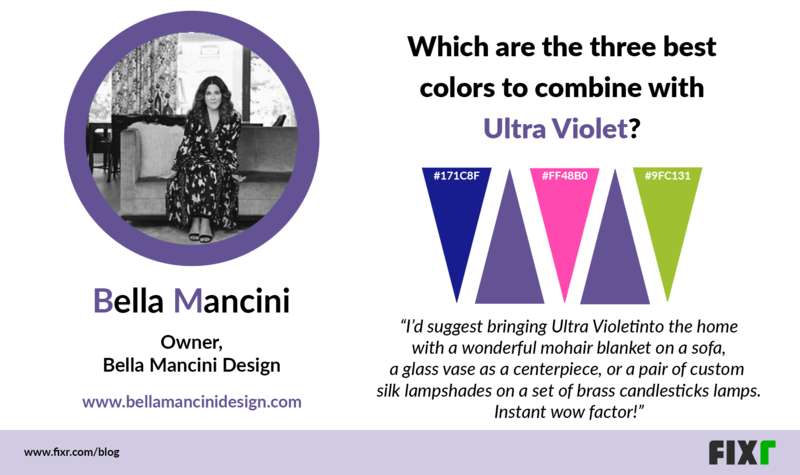 As the industry and consumers alike look to Pantone for inspiration in home design, we reached out to 30 of the top influencers in the home design industry for their advice on colors to combine with Ultra Violet and how to bring this vibrant shade into the home. 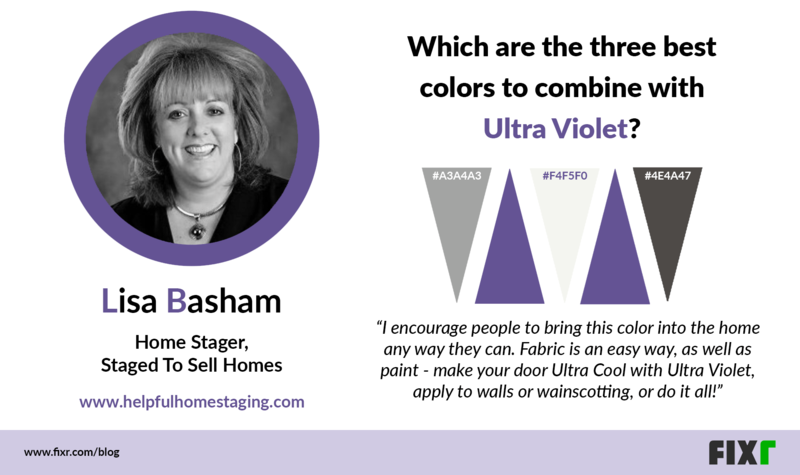 A special thanks to all who shared their knowledge and expertise in the fields of design and home staging. To see all influencers’ answers, go here. 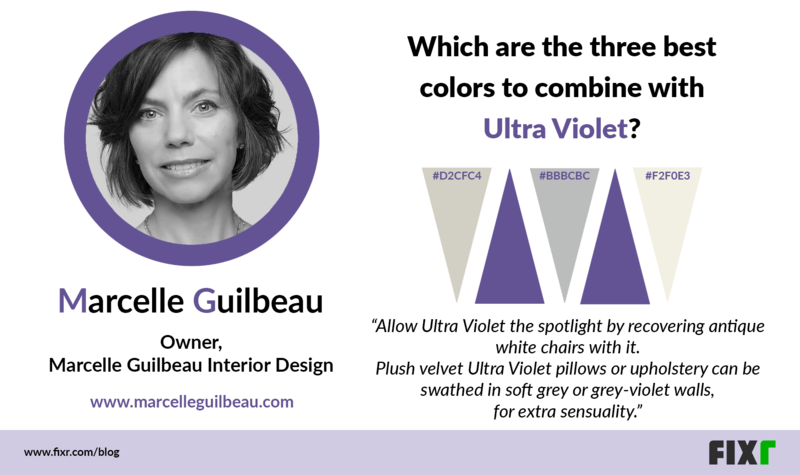 The below infographic details the many shades our top experts recommend when it comes to pairing with Ultra Violet. 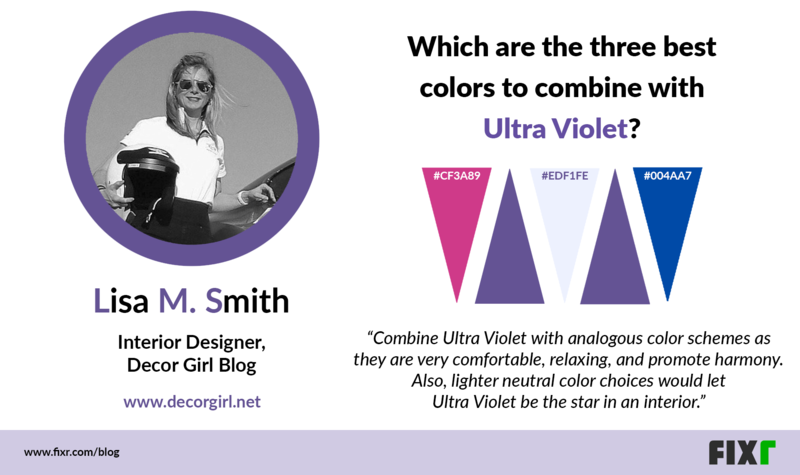 Our top influencers were asked to suggest three colors that would pair best with Ultra Violet. 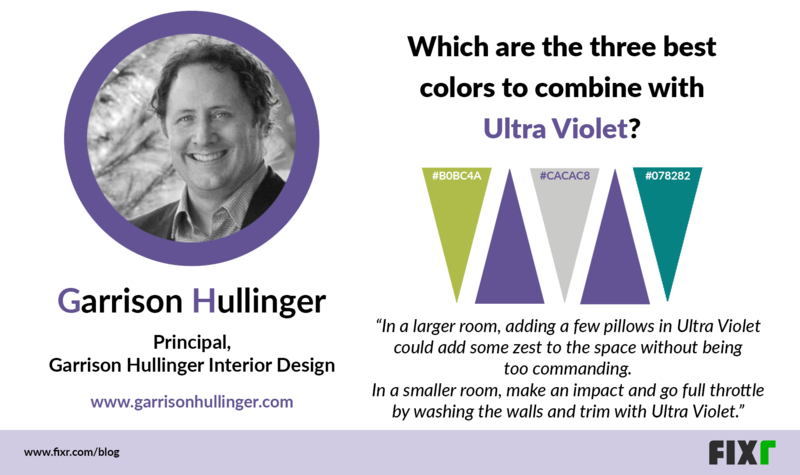 The infographic shown here displays the color choices chosen, grouped by hue. 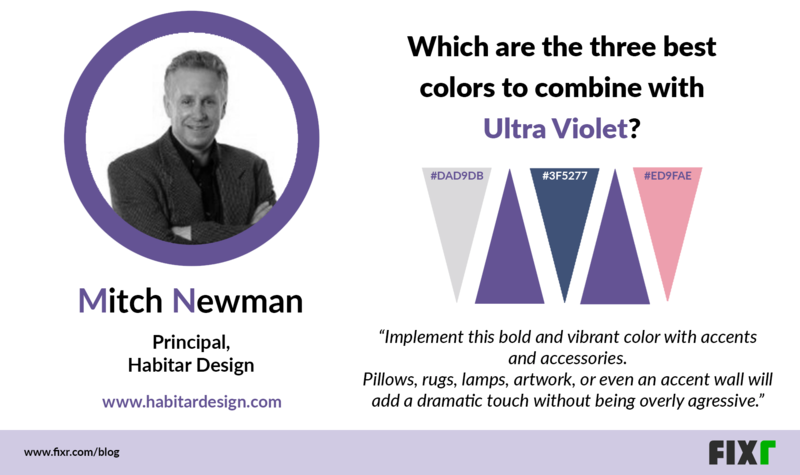 An analysis of the survey results indicate the the majority of colors suggested are in the Grays & Blacks (29%). 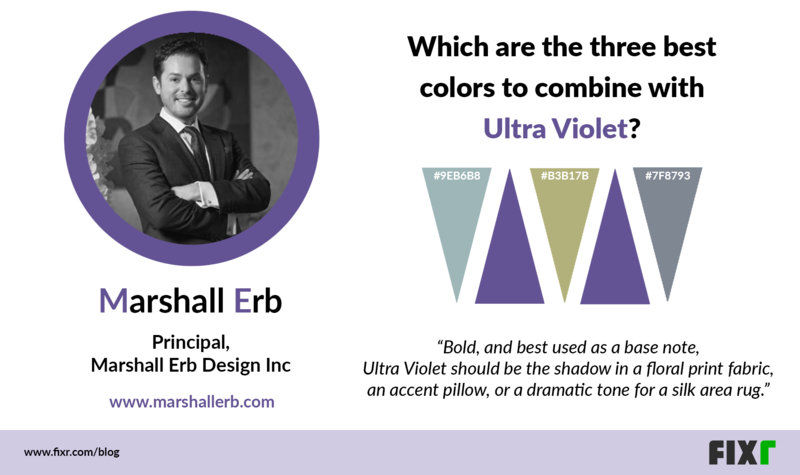 Greens & Yellows follow with 26% and Pinks & Violets round out the top three with 20%. 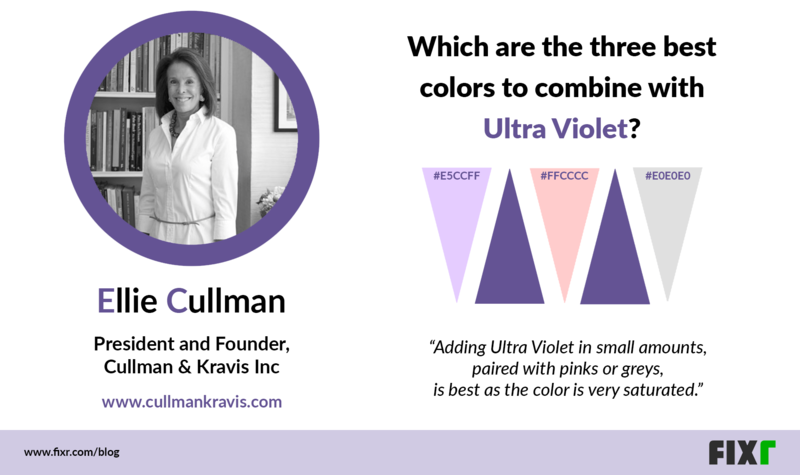 Blues, Whites, and Others complete the remaining 25%. 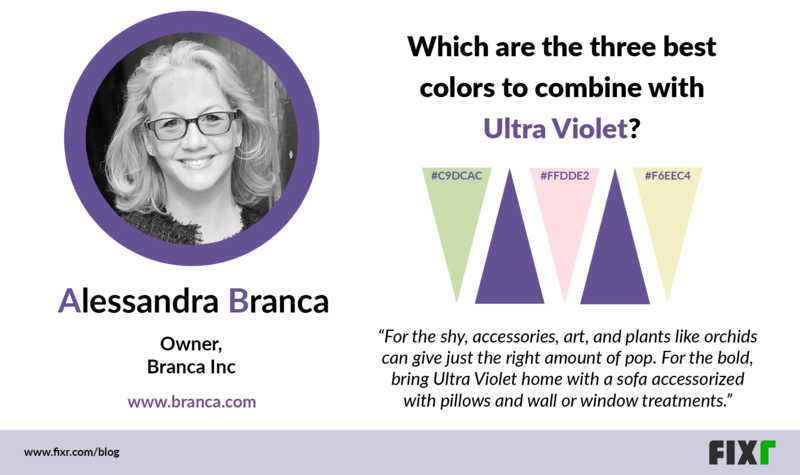 Out of the total 90 color suggestions, two colors were suggested by more than one respondent: PANTONE 11-0604, Gardenia (HEX/HTML F1E8DF) and PANTONE 11-0601 TCX, Bright White (HEX/HTML F4F5F0). 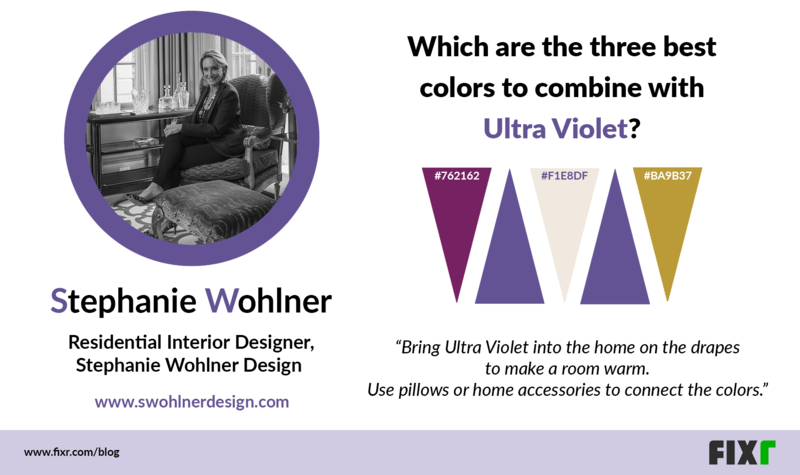 Our experts give us their personal advice when it comes to bring this hue into the home. 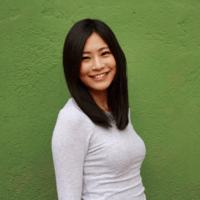 Here you can see their choices and visit their website. 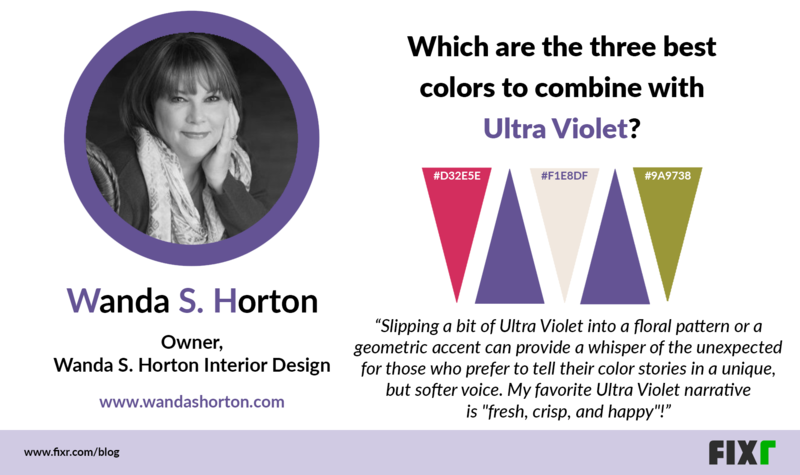 The majority of respondents (60%) suggest bringing Ultra Violet into the home in form accent pieces. 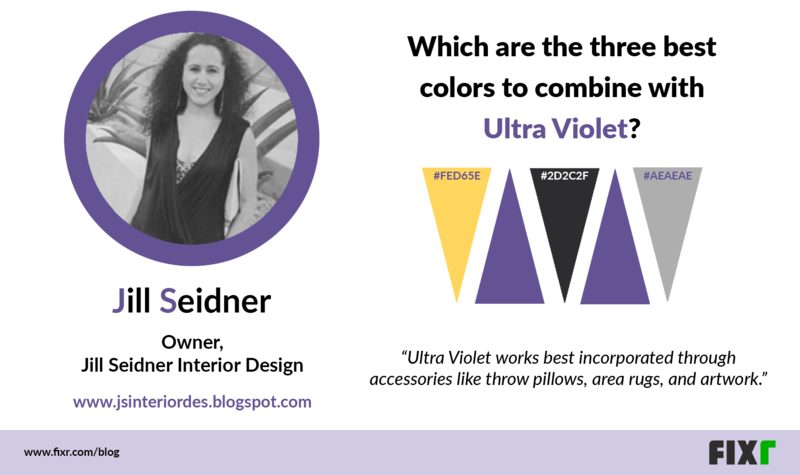 Twenty percent suggest a sofa or chair in the color while 50% suggest pillows. 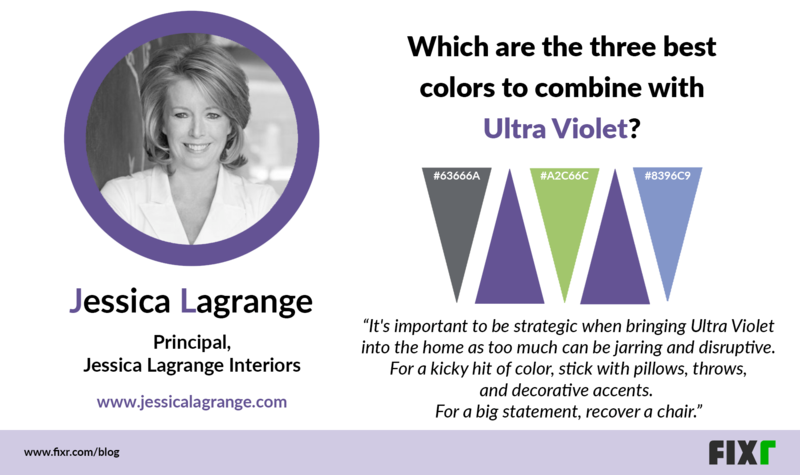 Jessica Lagrange, Principal of Jessica Lagrange Interiors, suggests sticking to inexpensive additions such as pillows, throws, or other decorative accents. 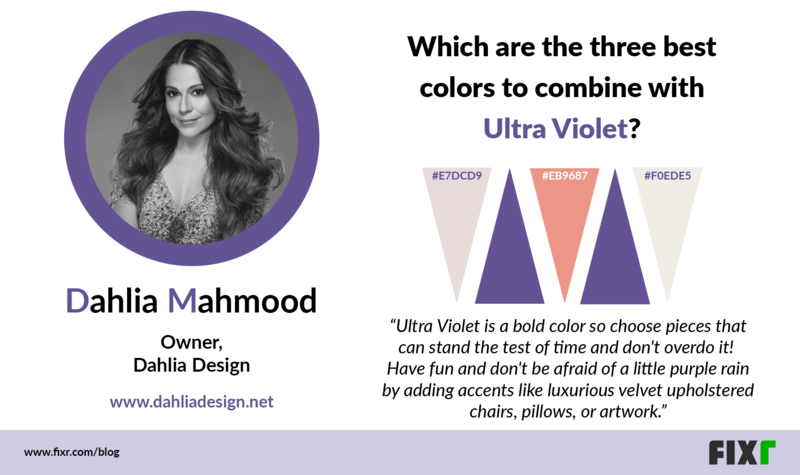 Or she says, if you want to make a larger statement, try recovering a modern piece such as an Arne Jacobsen’s Egg or Swan chair in the intense hue. 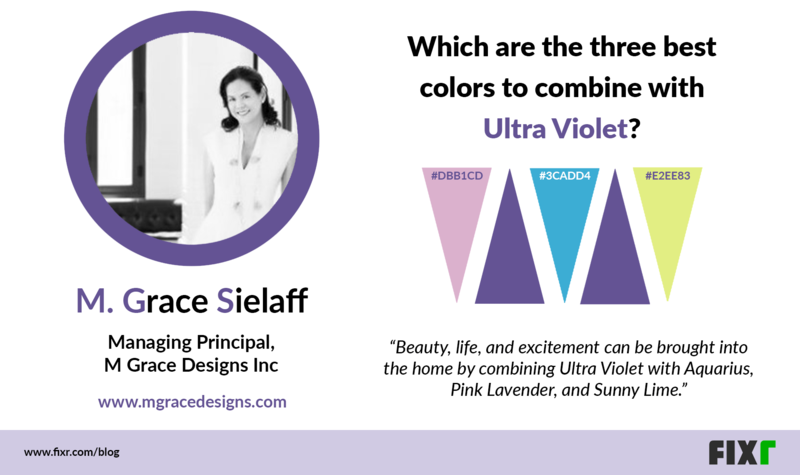 Four respondents (13%) suggest incorporating the color into your home through the use of plants or flowers. 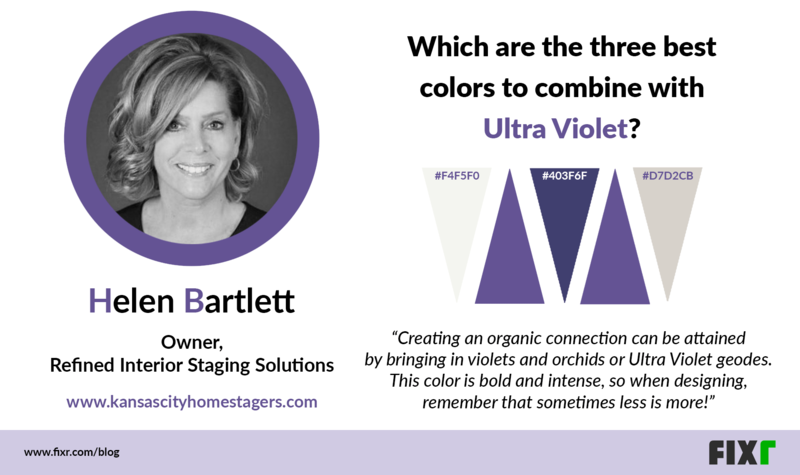 Orchids especially incorporate Ultra Violet into the home in a natural way. 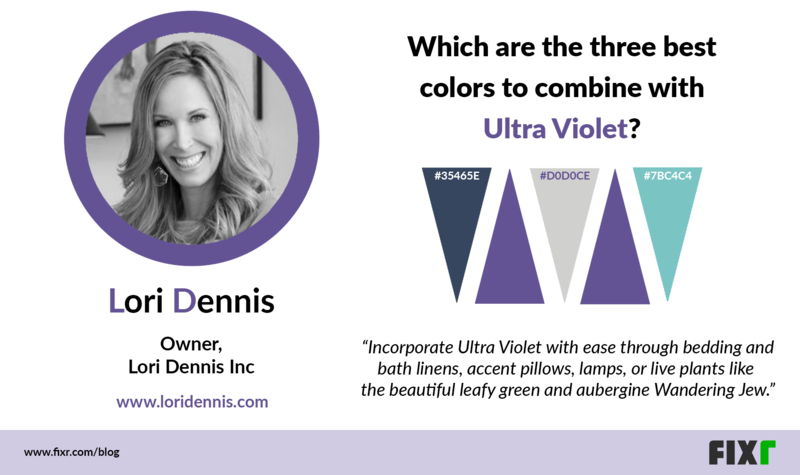 Coincidentally, plants and flowers naturally contain green and yellow hues, making them a good choice in terms of the one of the top recommended color pairing groups (Greens & Yellows). 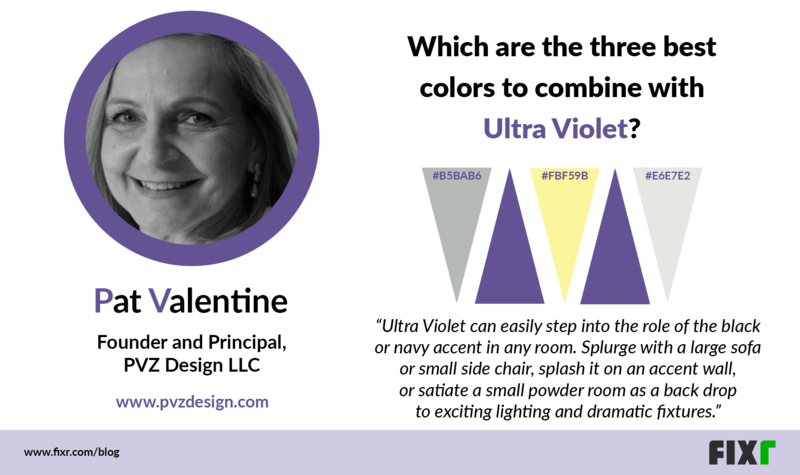 Nearly one-third of respondents, nine in total, suggest bringing Ultra Violet into your home sparingly. 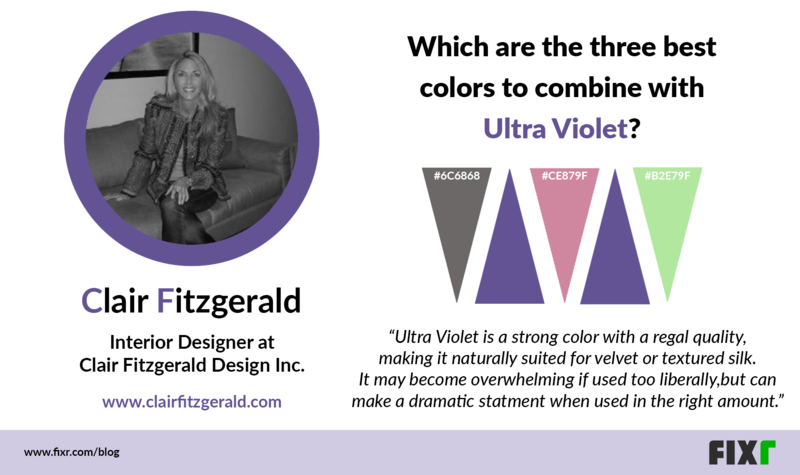 Clair Fitzgerald, Interior Designer at Clair Fitzgerald Design Inc., notes that Ultra Violet is a strong color and could be overwhelming if used too liberally. 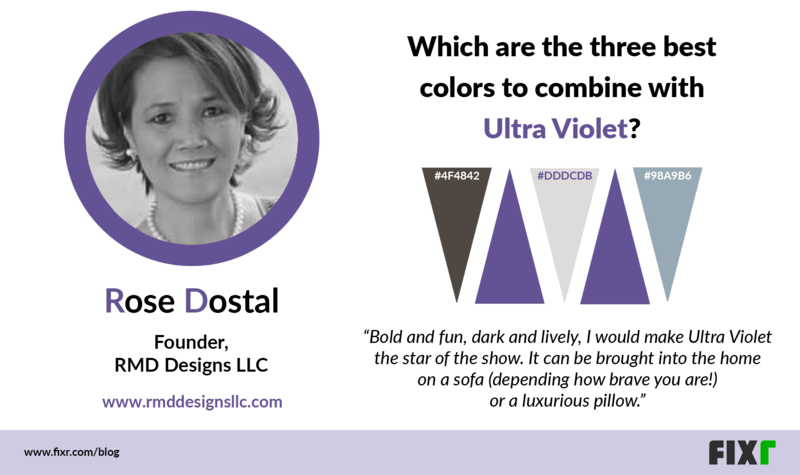 She goes on to say that the shade can make a dramatic statement if added in just the right amount. 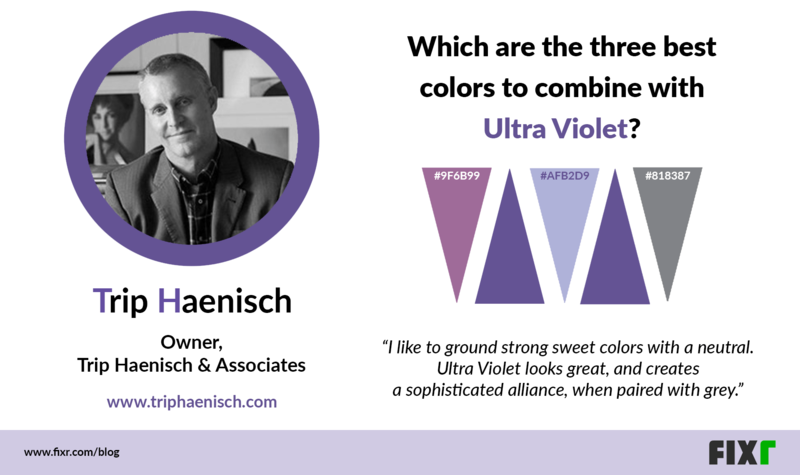 The “richness” of this year’s hue is a common theme among many of the experts. 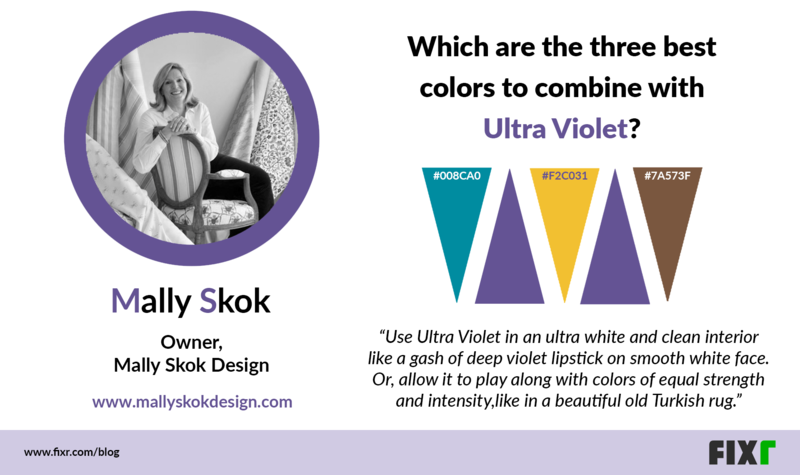 Mally Skok, Owner of Mally Skok Design, proposes using Ultra Violet as part of a “rich and sumptuous palette like that in a beautiful Turkish rug, where nothing dominates but beauty is observed through the colors all glowing beside one another”. 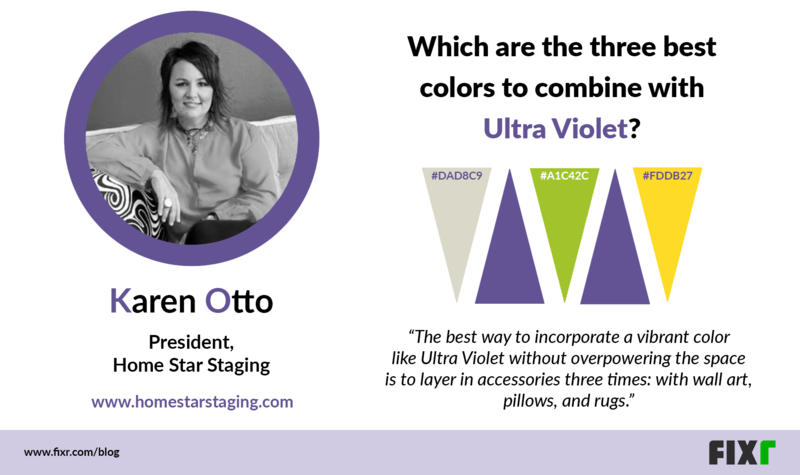 Helen Bartlett, Owner of Refined Interior Staging Solutions, goes on to describes Ultra Violet as a color being associated with royalty, never meant to common. 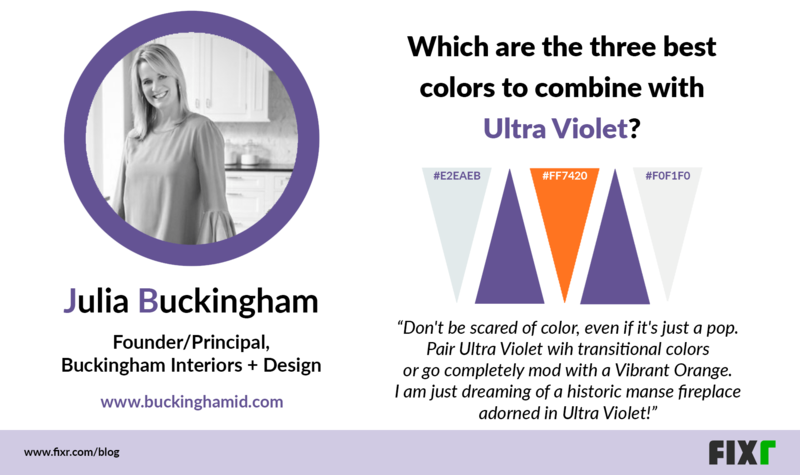 She suggests letting the richness and intensity of the hue stand out in ways that compliment the entire space without dictating the whole color scheme, reminding us that sometimes “less is more”. 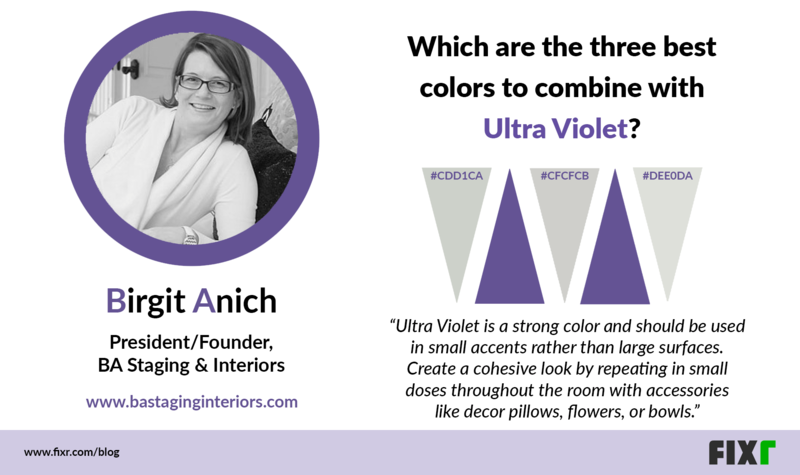 So, whether you stay small and bring in plants and accessories, or you “go bold and consume the space” as suggested by Lisa Wolfe-DiGanci, Owner of Lisa Wolfe Design LTD, there is a way for every unique preference and budgets of all levels to apply the experts’ advice and enjoy the benefits and beauty of this year’s Pantone Color of the Year.